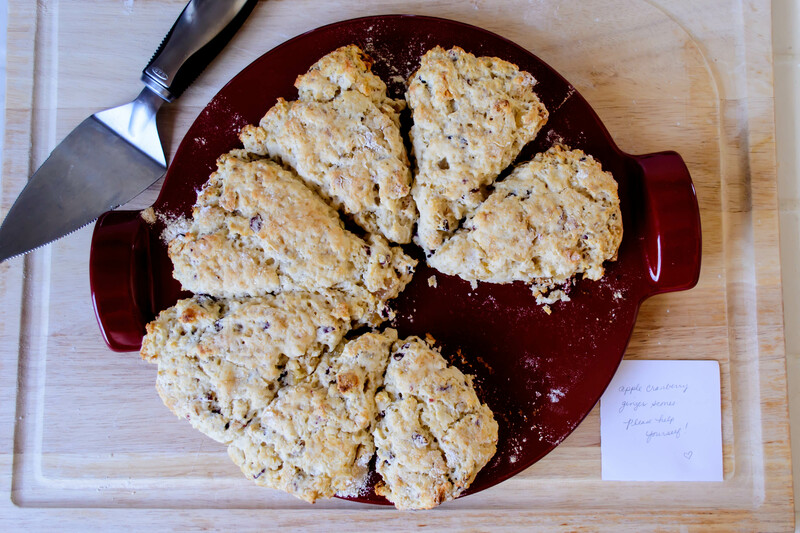 scones | "blackberry-eating in late September"
It’s going to sound a bit cliché to do this – a literature major starting a post with quotes about April – but it has again proved itself to be the cruelest month. Really, as a medievalist I should be referencing Chaucer, and I do prefer his April – with its sweet showers and sleepy birds and waking pilgrims – to T.S. Eliot’s earthy disturbance of memory and desire, but this year Eliot is unfortunately more apropos. April is a thief. It stole things from me, and from others I love. It sapped me on a personal and a professional plane, and on levels both trivial and profound. In the wake of April’s larceny, which began on the very first day of the month, something had to give, and that something was this something. The ease with which I slipped in a substitute post was insidious, and to manage my own needs, I had to allow that ease to linger. Now that April has blustered its way out of our lives, now that I’m picking my way delicately up the slope that everything I dropped created, I think we need something warm and comforting, but bright. Something to wake up those sleepy birds and push us forward on our pilgrimages. There are several search terms for the 2016 project that involve blackberries, which is no surprise. However, I just couldn’t see my way ‘round “blackberry sauerkraut party meatballs” (any ideas? ), so I settled on “ginger blackberry scones” instead, borrowing a bit from a Bon Appetit base recipe for cream scones. There is much, and also not a great deal, to say about scones. Richer than a biscuit, drier than a cake, they are a crumbly compact package I would eat at any time of day. Studded with chopped crystallized ginger, bright with citrus zest and weeping with the purple stain of lurking blackberries, they are capable of offering comfort even in the final days of the “stony rubbish” that is that cruelest of months (Eliot 20). Preheat the oven to 375F. In a medium bowl, rub the sugar and citrus zest together until the zest is evenly integrated and the sugar and your hands smell of its brightness. Whisk the zested sugar with the baking powder, baking soda, salt, and three cups of flour. 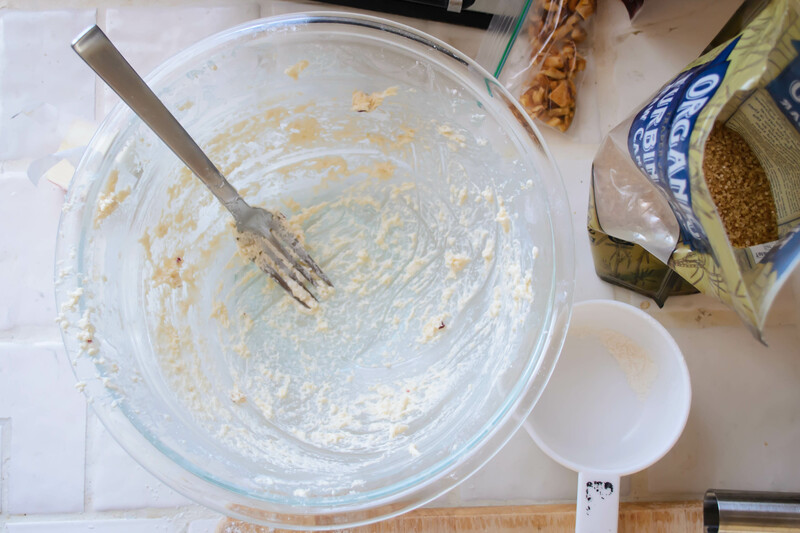 Add the butter chunks and, using a pastry blender or your fingers, work the butter into the flour until only small pieces remain – some will be the size of oats; some will be more like peas. Add the blackberries and chopped ginger and toss gently to incorporate. Make a well in the center of the mixture and add the egg and the 1¼ cups cream. 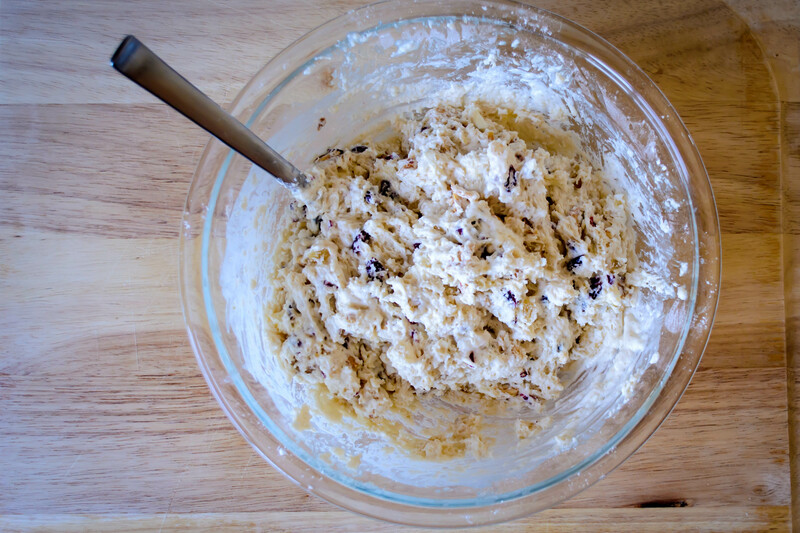 Use a fork to mix, incorporating the wet and dry ingredients gently, until a shaggy dough forms. Lightly knead in the bowl just until it comes together – a few dry patches are fine. Some of the blackberries will lose integrity, bleeding through the dough. That’s okay too. 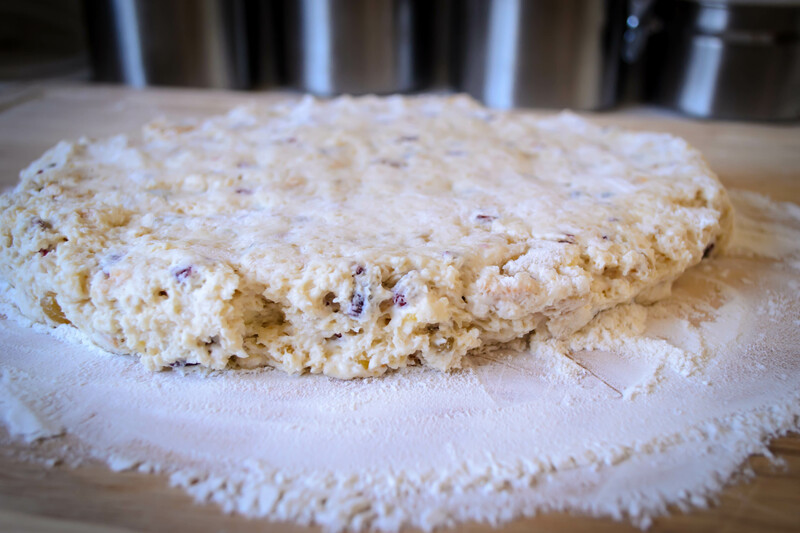 Turn the sticky, shaggy dough out onto a floured board and pat it into a round (more traditional) or a rectangle about 1 inch thick. Cut into wedges/triangles (a pizza cutter works well for this), or punch out rounds with a cutter, and transfer to a parchment lined baking sheet. Brush tops of scones with a bit of cream, then sprinkle with raw sugar if desired. Bake at 375F: 25-30 minutes for large scones, 20-25 minutes for medium or small. They will blush pale gold when they are done, and the bottoms will bronze a bit darker. Remove gently to a wire rack and let cool a few minutes before eating. If desired, you can leave off the brush of cream and sugar, and instead, when the scones are cool, drizzle them with a well-whisked mixture of 1 cup powdered sugar, ¼ cup lemon juice, and 2 teaspoons vanilla. This month’s archive makes it look like I’m harboring a bit of a sweet tooth. Nothing wrong with that, necessarily, but I should tell you this week’s entry is actually at N.’s (indirect) request. A month or two ago, my beloved aunt sent me some specialty King Arthur flour, and along with the packages of semolina and European style AP blend came a catalog. Naturally, this has become my bedtime reading (what, you don’t read cookbooks and kitchen magazines in bed? ), and on Monday night as I dawdled longingly over a blurb about Double Devon Cream, N. surfaced from internet-land and glanced at the facing page. 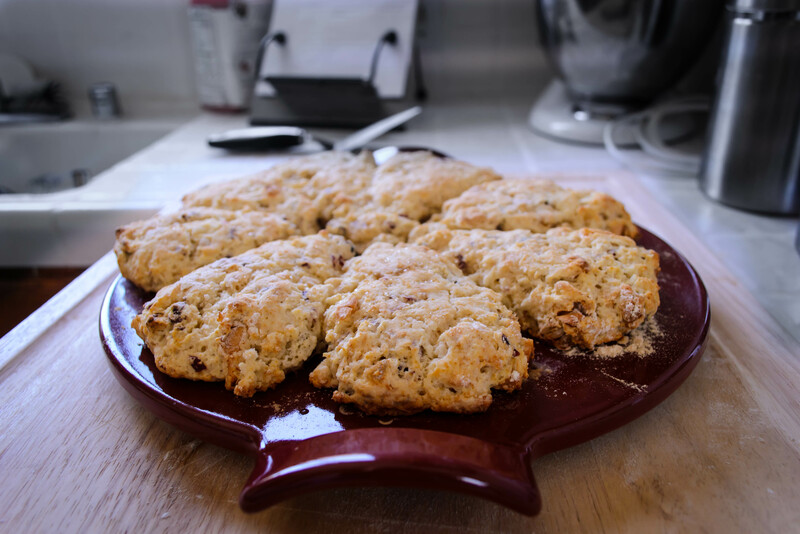 “That,” he said, and pointed at a photograph of some cranberry orange scones. “You want scones?” A silly question, apparently. “That.” So here they are. I did some research (i.e. food blogs and recipe comparisons from the other cookbooks stacked on my nightstand) and found, as usual, that Deb has all the answers. Seriously, is there anything the woman hasn’t made? 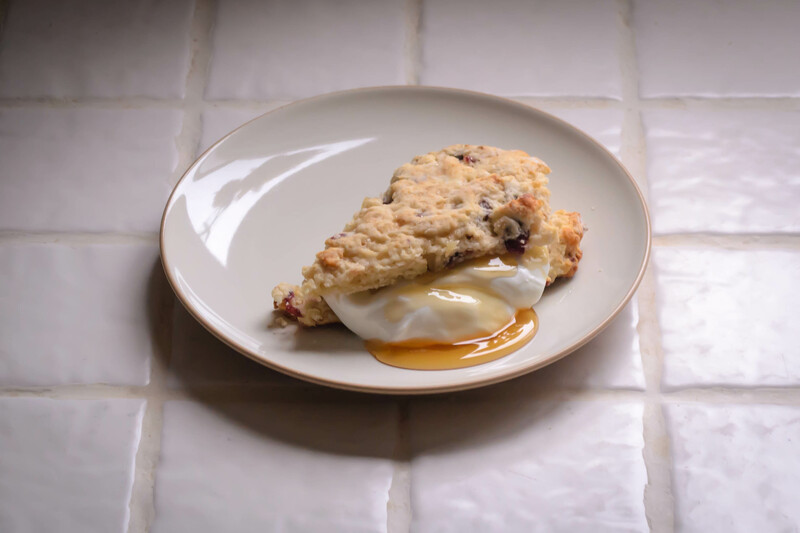 I adore you, Deb, but really – a person can only repress the green-eyed monster for so long… This adapts her recipe for “Creamy, Dreamy Scones,” which she got from the America’s Test Kitchen Cookbook. I’ve used a combination of cake flour and all purpose flour for a lighter texture, allowed turbinado sugar to stand in for the regular sugar, and replaced some (okay, most) of the cream with whole milk, because I lost my mind this week and, forgetting the intended use of that little container, dumped most of it into an unholy-but-oh-so-heavenly conglomeration of chard, bacon, and bourbon. These scones take advantage of the bags and bags of dried fruit that inevitably collect in my pantry. You could probably add other flavors as well, but I thought apples and cranberries, and the candied ginger I’ve been obsessed with for at least a year now, would play well together. Apricots would probably be beautiful too (unless you are, like one of my family members who shall remain nameless to protect familial harmony, freaked out by dried apricots because they apparently bear an uncomfortable resemblance to mouse ears). 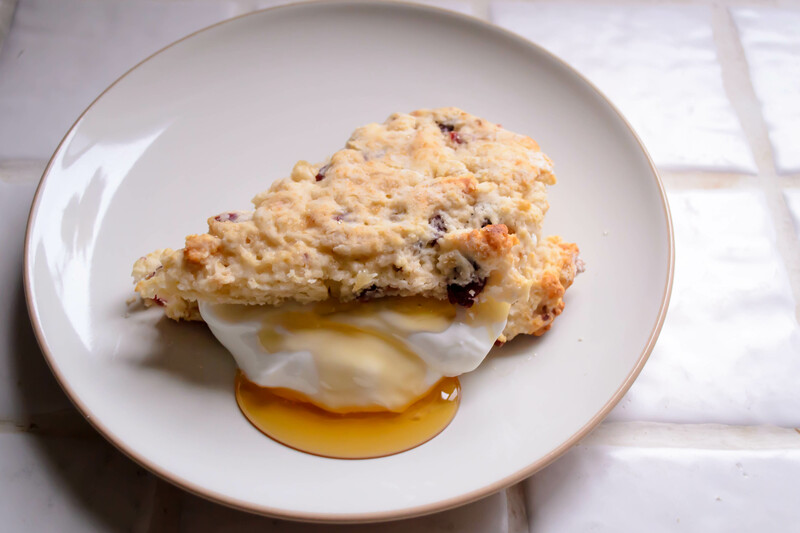 Scones come together much like biscuits: whisk the dry ingredients, cut in the butter, stir the milk/cream/buttermilk and flavor additions in with a fork. But then, and this is where things can go awry, you have to pat it into a circle and either punch out rounds with a biscuit cutter, or slice the whole thing into triangles. I chose the latter. This dough is, if we’re honest with each other, an almost unmanageably sticky mess. Resist the temptation to mix more flour into the dough, because the more flour you add, the less tender the finished scones will be. But do be prepared to sprinkle flour over everything it will come in contact with. I used a floured pizza cutter to slice it into eight pieces, which tore up edges and corners even while the dough clung fiercely to the board below. 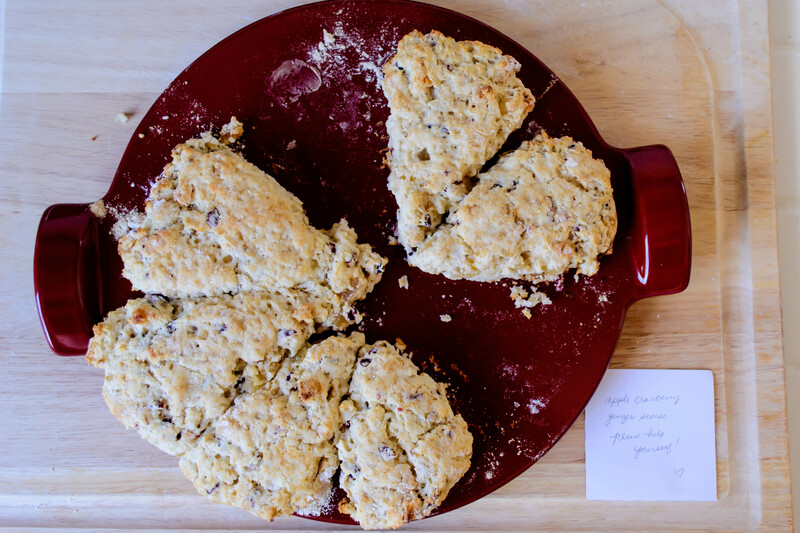 A bench scraper tool is really helpful for transferring your scones to their cooking vessel – a parchment lined baking sheet would be fine, but I used my brand new enameled pizza stone because I’m so jazzed about it. This, because I preheated it along with the oven, made the scones sizzle as I levered each one onto its surface, and rather than sticking (which I was dreading, since I realized only after they’d been in the oven for five minutes that I hadn’t greased or floured the cooking surface AT ALL), produced a crisp bottom crust. I left my offering on the pizza stone to cool while I took the dog for a walk, and returned to find it had been accepted. An hour or so later, it had been accepted again. These are best on the first day, but will keep acceptably for two or three days if they are well wrapped in aluminum foil and stored at room temperature. Chances are – if your family is anything like mine – this short storage period won’t be an issue. Still warm, these make perfect hand-held afternoon pick-me-ups (the ginger really zings you out of the 3 o’clock slump), but if you want to go the extra mile, I recommend slicing them in half so you have two triangles, stuffing them with Greek yogurt and a decadent ooze of local honey, and attacking with a fork for breakfast. Adapted from Smitten Kitchen, who used America’s Test Kitchen Cookbook. Position a rack in the middle of your oven and preheat to 425F. If you will be baking on a pizza stone, put it in the oven to preheat as well. If you will be using a cookie sheet, line it with parchment paper and set it aside. Whisk together the flours, baking powder, 3 TB of the sugar, and salt in a medium bowl. Cut in the butter using a pastry blender, two knives, or your fingers, until the largest chunks of butter are the size of small peas (sidenote: “peas” seems the universal size for butter chunks – why is that? Is there no other pea-sized object so regular and recognizable in size that we could call upon? Ball-bearings? Corn kernels? Canine teeth?). Pour in the cream and milk (or just use all cream, if you have it) and mix it around with a fork until an evenly hydrated, extremely sticky dough forms. 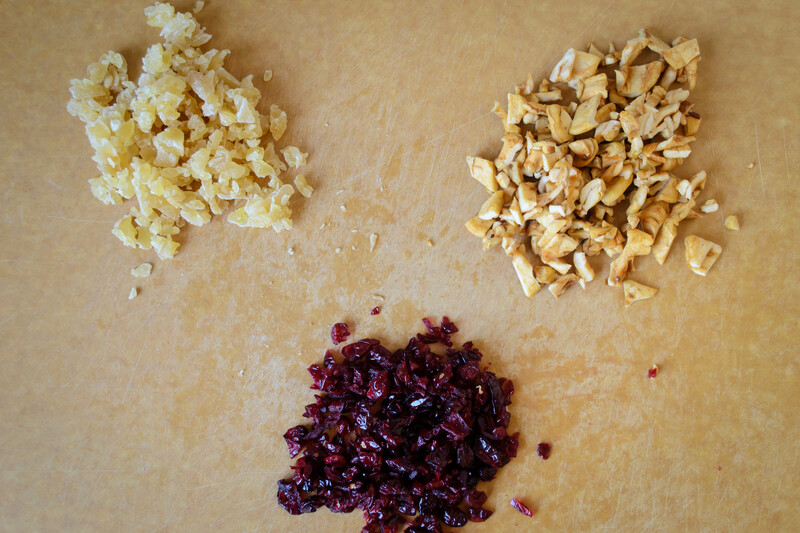 Add the fruits and mix again until evenly distributed (you may have to work a bit to break up the ginger pieces). Dump the sticky mass out onto a well-floured board. 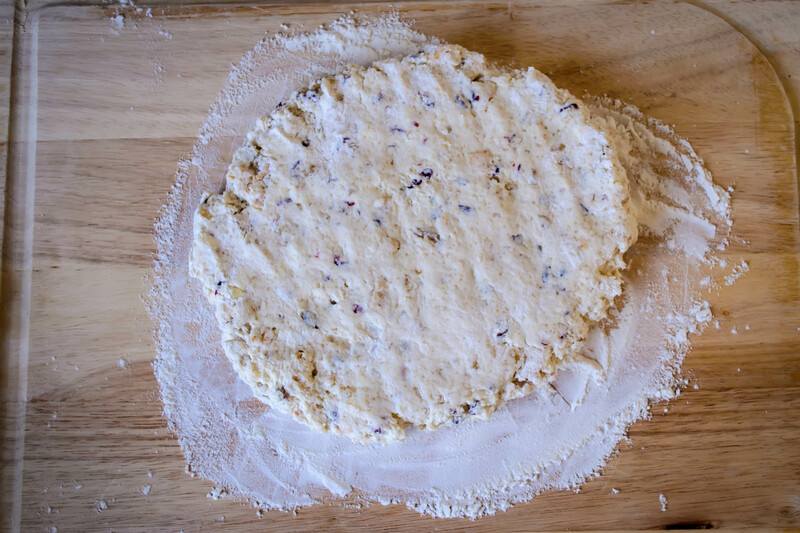 Sprinkle a little flour on top as well, then pat the dough out into a circle about 1-inch thick. Try not to add too much flour, lest they become dense and tough. 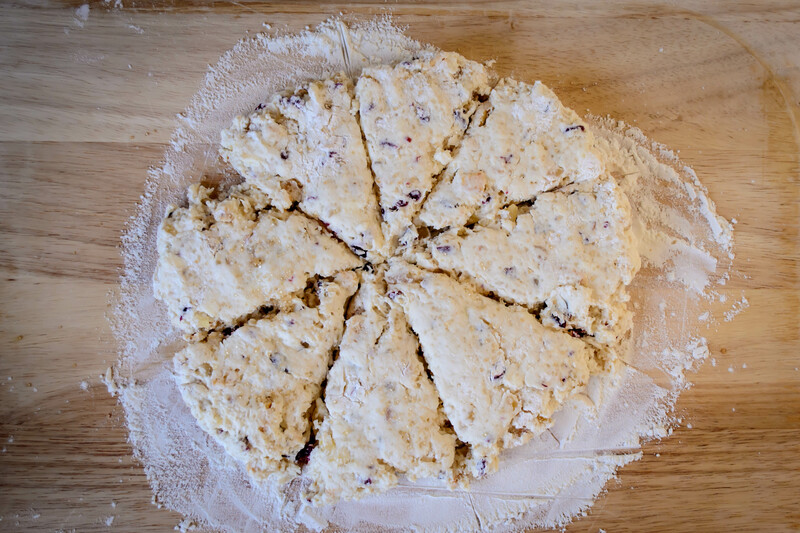 Dip a pizza cutter or other thin, sharp knife into flour, then cut the circle into 8 equal sized pieces. You may need to scrape off and re-flour your slicing instrument between slices. 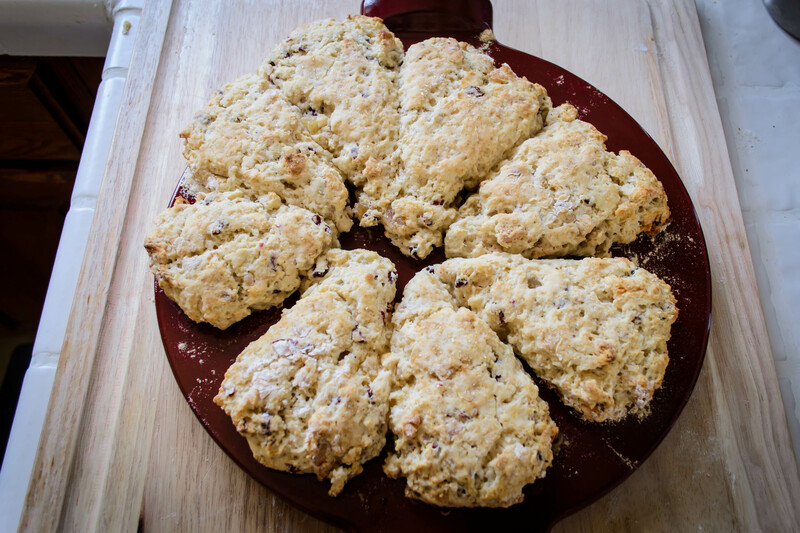 Using a bench scraper, a thin spatula, or (if you are brave) your hands, relocate your 8 scones to your prepared baking vessel, spacing them a half inch or so apart (they will puff and rise a little bit, but not tremendously). Sprinkle the tops with the remaining 1 TB of sugar. Bake for 13-15 minutes, or until lightly golden on top and cooked through. Cool at least 10 minutes before removing to a wire rack. Eat warm or cool.